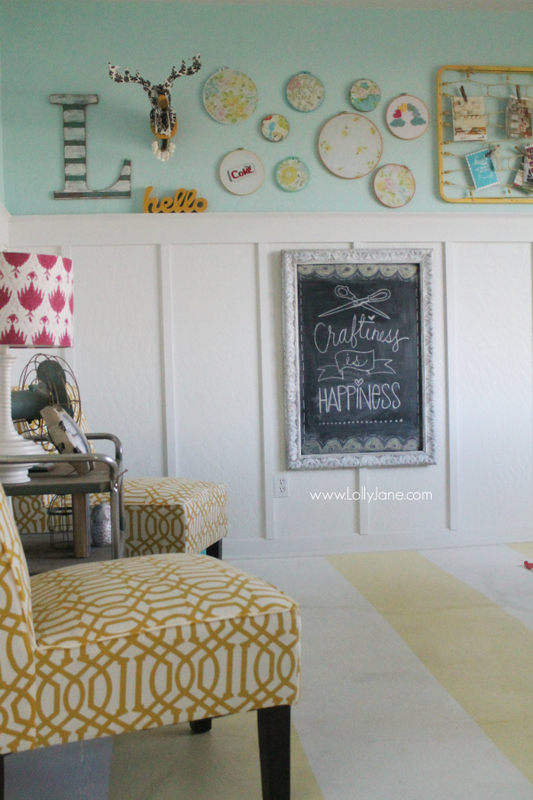 The monogram L is for Lolly Jane, I borrowed this frame turned chalkboard from Kelli’s ombre wall and just love it in this space with my freehand chalk art! Kelli’s favorite thing about this whole room are these pretty floral curtains (see the birds?) from World Market that our talented seamstress sister modified to fit the space by simply adding ruffles + lace. They definitely add a feminine touch to the shabby distressed projects throughout the room! Interested in owning this amazing mag? Buy a digital copy here! And a hard copy here! They’ll be for sale at JoAnn’s, Michaels + Hobby Lobby this weekend! Previous Post: « Master Bedroom Refresh, hello yellow! I love the price friendly solutions! Your creative space looks fabulous. Oh I love those crates and suitcases! Clever! Great ideas in these pictures. Love those STRIPES! The space is amazing; I love the cheerful color scheme. The floors are fantastic. The chairs were nice, but big comfy ones are better. I have wanted what I call a “Momma Bear” chair in mine, but my room is WAY too small for that. Thanks for sharing. I swore I wouldn’t pick a favorite early in the blog…but this stole my creative heart! I love the floor (and the ombre wall). Can’t wait to see the whole article on your studio. tfs and congrats! Can’t wait to see this magazine! Your craft room looks wonderful. Congrats on the magazine feature! It’s well deserved since your craft room is so amazing! Cool space, love it! Congrats on being in the magazine, it looks like an amazing issue! Those curtains. Seriously. I die. Wow this looks really great. Oh my goodness, such a cute room. I love it! Super jealous at this awesome space! Wowza! Congrats! How exciting! Of course they featured you, that room is amazing! Can’t wait to see the magazine! What a beautiful craft room. I wish mine was that bright. The floors turn out fine. Lol. Love the vintage suitcases! Love your space! OMG! Those suitcases are to die for and the wooden boxes are just as marvelous! WOW! Would love to get my hands on all of them! Your space is quite amazing and drool worthy! Can’t wait to see the other Creative Spaces in this edition! TFS! I need to get some crates for storage – I love those! So so so very thrilling to be published. And that amazing craft room is what brought me here almost a year ago! One question, have you filled in the herringbone wall with more “stuff” or does it really still look that organized and lovely? Love the idea of the chalkboard frame. I happen to have a frame from my DD’s grad party photo booth that I can use. Also love the baby bed spring that you repurposed as posting board. A cheerful and happy place. Thank you, Connie! Scored them at World Market, cut them in half, surged them and added ruffles for length! Lovely space. I find it funny the pressure we can put on ourselves to have things be perfect. I wish you would have kept the chairs that you prefer and actually use in your space- even if the decor chairs were fabulously cute. I love the stencil pattern design not he back of your shelving wall and painting your floor–I might like to do this in my house. Love your room! Great pieces! I love your table and chairs in your creative space. I like the colors you’ve chosen and all the ideas. Congratulations!! That’s awesome!! You deserve it!! … if you aren’t happy.. *aint no one happy * LOL so cute.. thanks..
Love the ideas from your studio and blog! Great ideas and I love the curtains! I like the crates and suitcase, very smart! Thank you!! We love to upcycle and hide things lol! 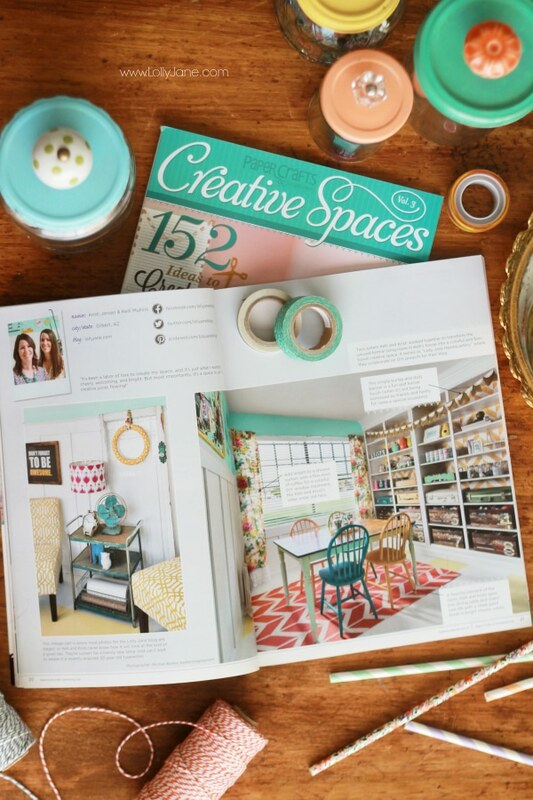 Beautiful crafting space – love the bookcase!!! I like the curtains too. I’ll have to get back here when I have more time to look at your tutorials, but this blog hop is looooong!! Thanks for the beautiful pictures! LOTS to take in, Carmen, lol!! Thanks for stopping by! I love those vintage crates…how fun is that??? great looking craft room. 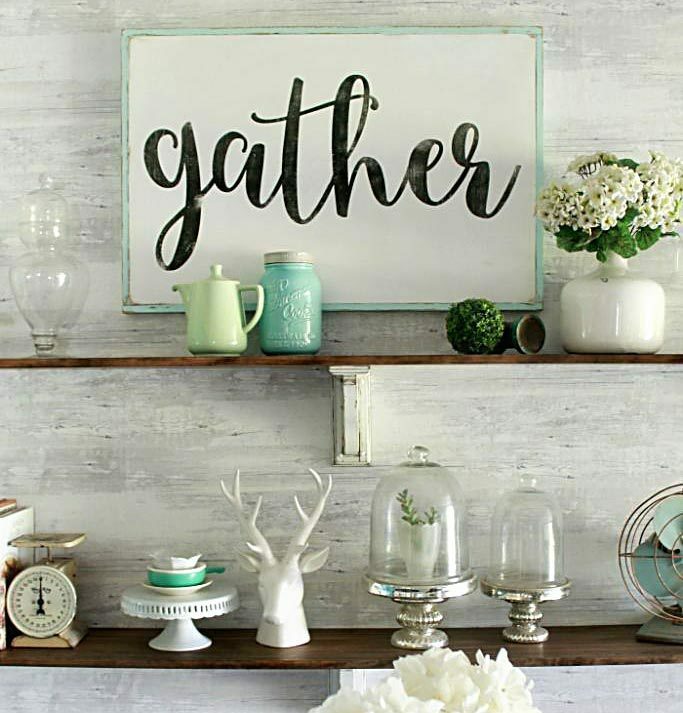 Such creative uses of items that can be thrifted and transformed into functional and interesting elements for storage and inspiration. Love the color combos and mixes of patterns to add even more interest!!!! So many amazing details…where do I begin! Love the stripes on the floor, love the rug and the painted beadboard behind the shelves as well. Love the ruffles on the curtain. Awesome job! Can’t wait to see your whole space. Thank you for offering a giveaway. Thanks for sharing. Beautiful space. I love, love, love the curtains too! Your space is amazing. It looks like it belongs on the pages of BHG or HGTV magazine. I love your bird cage and lanterns , your rugs, table and mismatched chairs I love the way you designed your embellishment storage. Your space is GORGEOUS!!!!! Color me green with envy!!! I love the mix of colors in your room. It looks like such a happy place to be. I LOVE your space…so bright and cheery! Oh! 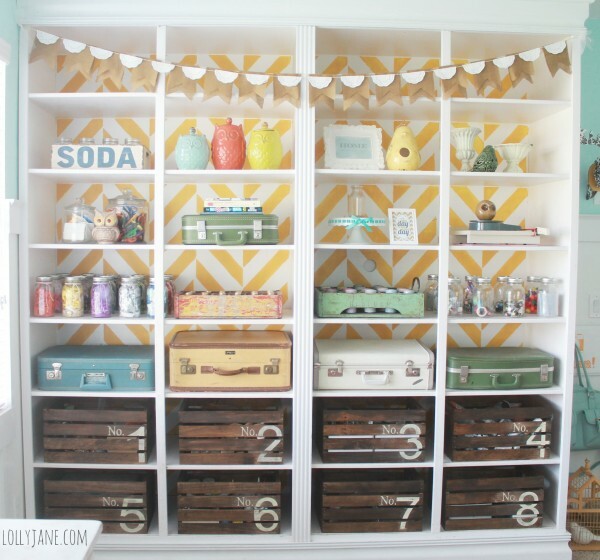 I’m not sure what I love most … the yellow chevron paint detail behind your shelving or the lovely hanging bird cages. What a beautiful space! Such a bright and cheery space! Thanks for sharing your craftroom space. I fell in love with your craft room the first time I laid eyes on it. I love it even more now! I think we need to have a craft play date. yours should be the cover, but I think it’s amazing!!! congrats on all your hard work, girls! Oh my goodness! 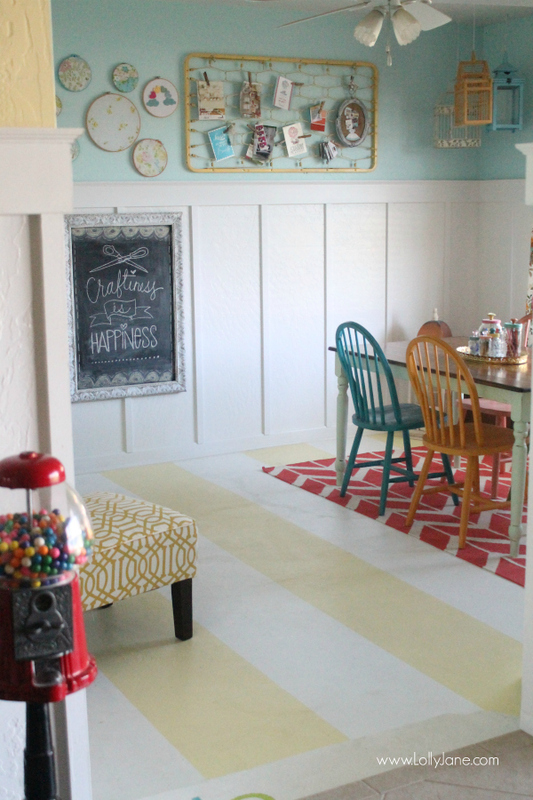 Love the painted stripes on the floor! And that bookcase is FABULOUS!!! Congrats on being featured! Can’t wait to see this magazine! 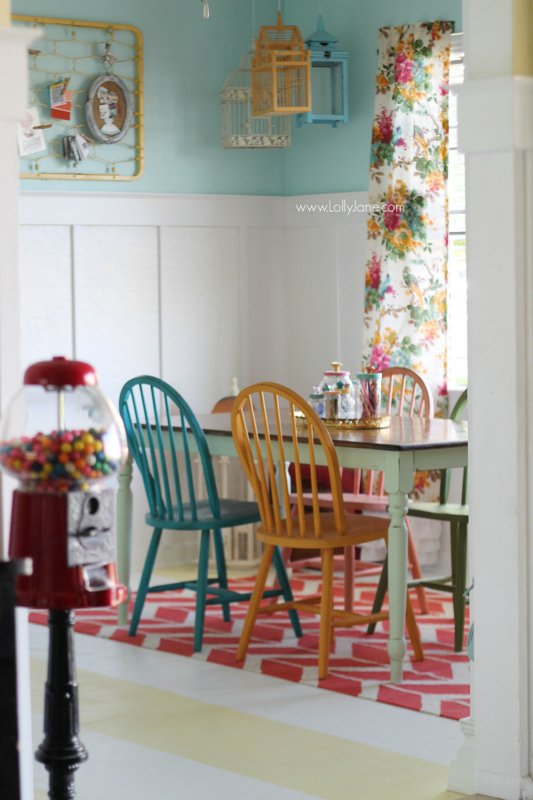 I love the fun colors in your fabulous space! Love the book cases and the painted walls behind. They look custom built. 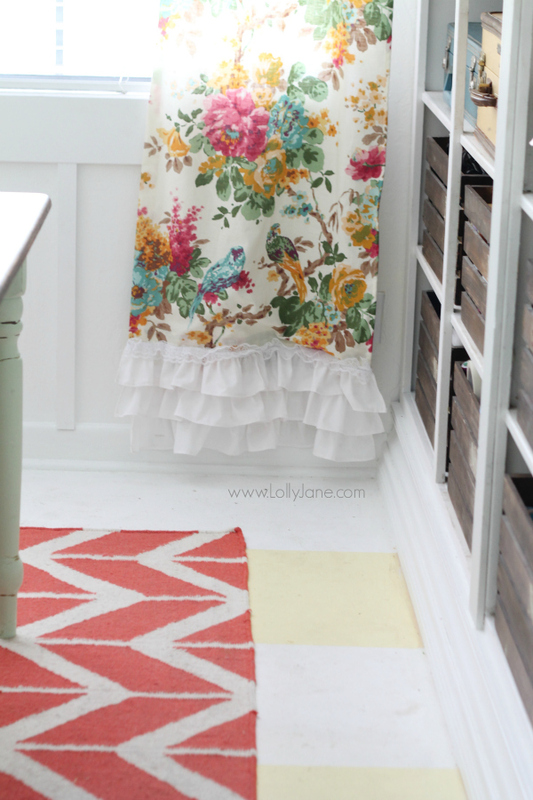 The ruffle on the drapes gives it a dash of girly! Great! Love this room! All the touches of yellow makes my day- its my favorite color! So cheerful! Your space looks very inspirational! Love the colors! Wow, gorgeous! I would never get anything done because I would want to sit and admire my space all day long!! So cool!! I really do super love this space!! And congrats on the magazine feature!!!! I’m so happy for you! That is awesome!! It is a crib spring mattress frame, Rebecca- easy find at the thrift store or on Craigslist! 😉 All we did was spray paint it yellow and hang it up. Easy card/picture holder, for sure! Chicas es maravilloso! Me encanta vuestra habitación creativa.